Capital City BMX has riders as young as 3 and as experienced as 65, but most are somewhere between 8 and 15. 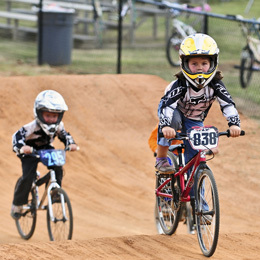 Also, BMX is certainly not just for boys, and a professional woman BMX rider recently held a clinic at the course. According to CCBMX, about 1/3 of the riders are girls. But just watching the race is fun for every age, and probably a good way to determine if that sport is something for your youngen – or for you! The track is located in Lions Park at 516 Dennis Ave, Raleigh, NC 27604. (Between Capital Blvd and Raleigh Blvd, 5 minutes NE of Downtown Raleigh) Lions Park is a nice but little known park, so if you get tired of BMX you can always head over to the playground, which has a pretty awesome play structure. Update: I edited the age group and the gender ratio after CCBMX replied to my last-minute inquiry. They also shared that will add strider bikes this year for the under 4 crowd. Rest assured that The Daddy is very excited about that and will keep you posted on that topic in a future post! This entry was posted in Action, Active, Outdoors by daddyweekly. Bookmark the permalink.